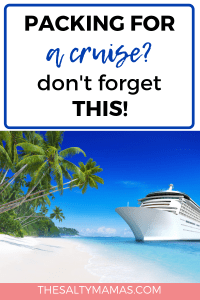 What to Bring on a Cruise- 6 Essentials You HAVE to Have! Every year, we plan a trip with our girlfriends. We have a core group of mom friends that we met when our babies were tiny, and they’ve been there for us through all the trials and tribulations of motherhood. As the kids get older and drift apart, however, it’s important to maintain our friendships outside of the kids. What better way than by planning a cruise with your friends? Over the years of our cruises together, we’ve come up with some cruise packing hacks to make your cruise packing list a little more robust. Of course you need some dresses, suits, and fresh undies. But a cruise is very different from other vacations. The limits of the rooms and the way the ship operates means that you’ll need our cruise packing tips to REALLY cruise in style. 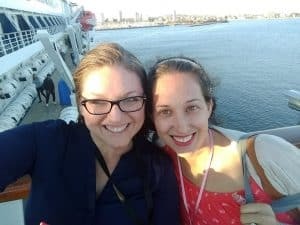 We’re heading away for our annual MomSquad weekend away, and we’ve got some cruise packing hacks that will help you pack for your cruise like a pro. And also, maybe make it just a little more fun. (Which, it’s a CRUISE. So that’s saying something). When you board the cruise, you’ll be given a little card, not unlike a hotel room key. This little baby is required for pretty much everything- buying items, ordering drinks, and getting into your cabin. You do NOT want to leave this lying around, or forget it in your room. Do yourself a favor and get a lanyard (either standard black or, if you’re traveling with a group, assorted colors for easy identification). They will make keeping track of your card so much easier…especially once you’re a few drinks in. Or lemonading. Or Ice-teaing. Whatever you’re into, you’re going to want a cute cup to cart your beverages back and forth so you’re not stuck at the buffet every time you get thirsty. Obviously, we recommend our adorable tumblers (see the full tutorial here), but any cup will do the job just fine. While your cutesy tumbler is full of tropical drinks, you’re still going to need to follow the basic hangover-reducing principle of drinking 8 oz of water for every alcoholic drink consumed. Get yourself a giant water bottle, and you can refill it whenever you pass a beverage station (and avoid paying top price for bottled water elsewhere). I mean, we’re not guaranteeing they’ll work for you…but we may have it on good, PERSONAL authority that these bad boys work for smuggling in some alcohol on the low-down. Not that we’d ever be cheap enough to do that of course. Wondering what clothes to pack for your cruise? We are obsessed with these little swing dresses on Amazon. They work as adorable cover-ups, and also look presentable enough for dining on the ship. They are super versatile, crazy comfy, and are easily adaptable for all parts of the ship. If you’re looking for practical cruise packing tips, might we suggest you bring a power strip (as well as chargers for your electronics). We triple up in each cabin to save on costs, but unfortunately those rooms don’t come with triple the outlets. Pack one of these to ensure that you and your friends aren’t fighting over the plugs when you’re getting ready for formal night or putting the phones to bed for the night. You probably know to bring Dramamine with you on your trip (we like this less-drowsy formula with ginger), but if you know you are prone to motion sickness, consider talking to your doctor before you hit the water. Those with severe motion sickness can get a prescription for a little behind-the-ear patch that will help your queasy stomach more than over the counter varieties. Even if you’re usually okay with motion, we recommend you pack a pair of these motion sickness wrist bands with you. You’d much rather have them and not need them, than need them and not have them. Not only that- but the mark up on medications on cruise ships is RIDICULOUS. Bring common over the counter medications- like Ibuprofen, Tums, Dayquil, etc- to avoid having to pay big money once you’re on the boat. 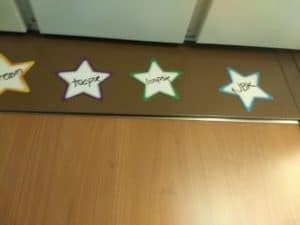 On our first cruise, we thought we’d bring a bunch of items to decorate our rooms’ doors. We quickly discovered that taped on paper items aren’t allowed (it poses a fire risk). Instead, we read online that we could bring magnets to decorate the cruise ship doors. We were SUPER bummed to discover that our doors were not magnetic when we got there. However, there was a bit of metal trim around the door, which we stuck the few magnets we had to. It didn’t do much as far as cruise ship door decorations, BUT we’ve now added magnets as a staple to our cruise packing lists. Why? Because allll the doors look the same, and it can be hard to remember which room is yours. Those little magnets at the top of our doors made it easy to find our rooms (even when were on the tipsy side- hence the blurry picture of them). 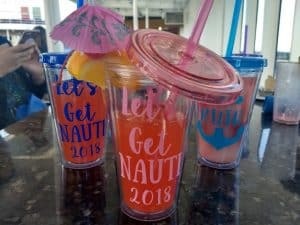 Different cruise lines may have different policies, but if you find yourself wondering, “Can I bring alcohol on a Carnival cruise?” Well, you’re in luck. Carnival cruise lines allows you to bring in one bottle of wine per person, as well as up to 12 canned drinks. So if you’re planning to smuggle in some hard liquor, consider bringing some cans of cranberry or lemonade to make your own cocktails. Last year, we didn’t bring hard alcohol on the cruise, but we did bring twelve cans a piece. It was really nice not to have to leave the room every time we wanted a Sprite or Ginger Ale to settle our stomachs. 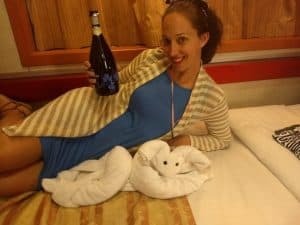 So do some shopping and make some lists- but whatever you do, don’t forget these cruise packing hacks to make your trip a little smoother. What would you add to the list? Happy Sailing!